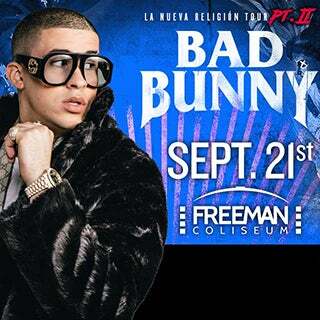 MIAMI (April 20, 2018) – After a historical year in 2017, the growing sensation across the world of urban music, BAD BUNNY, began 2018 with full force with his first North American tour, "LA NUEVA RELIGIÓN", taking his contagious Trap to cities throughout the U.S. Due to growing demand from his fans, the artist announced he would bring his music to more cities and to even more of the people who are eager to see their idol perform live. Fans across the US will have the chance to see Bad Bunny conquering the main Latin markets, including Arizona, California, Florida, Illinois, Nevada and Texas, among others. The tour will stop at the Freeman Coliseum in San Antonio on Friday, Sept. 21. Tickets are on sale now at Ticketmaster.com, ATTCenter.com and 800-745-3000. Bad Bunny had an epic 2017 and comes into 2018 with style. Just in the first week of the year, he was awarded with having five of his songs on Billboard’s Hot Latin Songs chart and featured in an article on the 2018 Predictions section that explores how he has taken Latin Trap to the forefront of the urban genre around the world. Bunny also celebrated receiving a nomination to the iHeart Radio Music Awards in the category of "Best New Latin Artist." Now, Bad Bunny is preparing to perform during Premio Lo Nuestro 2018, where he will light the stage with his incomparable rhythm and talent.